Thanksgiving morning don’t miss the Muppets at the Macy's Thanksgiving Day Parade. 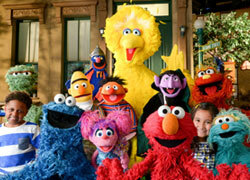 The cast of Sesame Street will be making their annual appearance. The beloved Kermit the Frog balloon will also be in this year’s parade. Other Muppet friends may be making surprise appearances as well. Well, the parade has officially started with the countdown/cutting of the ribbon, followed by that stock marching band version of "New York, New York" as we are listed all celebrity appearances. It did say at one point "The Beloved Cast of Sesame Street, and the Muppets!" Is it just me, or were Bert and Ernie not on the Sesame Street float this year? They were in the top window with Zoe; the camera didn't go near them. Looks like I didn't miss THAT much this year; Susan seemed absent from the float again. But it's good to see Bob still with the gang on the float. Anyone else notice that they are STILL playing the old 1992-2006 Sesame Street closing credits music whenever they introduce the float? I thought they would've replaced it by now! Muppet_dude, Susan WAS on the float. I've loved everything so far. The Kermit float was great and they even mentioned the new muppet movie! I also loved the Sesame float! The song was great and was so great to see the the (almost) whole cast there singing together! hopefully, we can see a special apearance by the muppets, maybe a song by . Looks like no Kermit the Frog appearance this year (outside of the float and balloon), at least on the NBC version. I'm kinda bummed out on that. 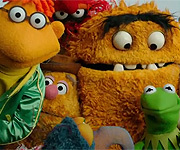 Was it just me or were the actual MUPPETS not there like they said they would in the opening credits? I might have missed it, but I saw the Kermit balloon, and I was confused at the lack of and and . Thoughts? Anyone got clips? I slept in and forgot to set the dvr. I know it didn't seem like much, but I thought that everyone seemed well put together. At least they gave camera time to the best characters like Big Bird. Although I do agree, more of Ernie and Bert would have been great too. And the best part was that both the balloon and the float were right at the start, just behind Snoopy and a few bands. So overall, the parade was somewhat of an eventful point for us Henson enthusiasts. I assumed right then that they were referring to the Muppets of Sesame Street. All in all, the Sesame Street performance felt extensively rushed. It seemed like it came and went in 75 seconds. I think they spent more time on the Kermit balloon than the Sesame cast singing. Was there any Muppet appearances? I swear they showed the Kermit float for a split second, and the Sesame float performance was cut shorter than normal. Does NBC have it in for the Muppets? I didnt expect there to be Muppet Show puppets showing up, but still...it seems more was made to do about the Kermit balloon and Sesame float in the past. The Today host announced the Muppets will be getting their walk of fame star next year, AND next year on Christmas Day the Muppet Movie will be released in theatres! HUGE NEWS because we haven't heard of an official release date till now. Actually, CoOKiE, the release date was announced over the summer. But, it is great to see them mention it and let more people know. Bannanasketch, i actually didn't know. I've been trying to keep up with the news behind the Muppet movie and Fraggle movie, but there is a lot more chitter chatter then news so i skim through the forums like every other month. sry beaker, i haven't looked around. i had the parade set on my DVR so i could sleep in till 2pm and still catch it lol.